■ Urethrovesical anastomosis is one of the most demanding steps of the whole laparoscopic prostatectomy. ■ The pubic bone impairs the visibility and the access to the urethral stump making the placement of the sutures difficult. ■ The preserved length of the urethra is essential to the quality of the urethrovesical anastomosis. ■ Relative preservation of the bladder neck contributes to the feasibility of the anastomosis. ■ The best and easiest anastomoses are obtained through an iterative sequence of maneuvers, ensuring an optimal management of the needle exchange between both needle holders. 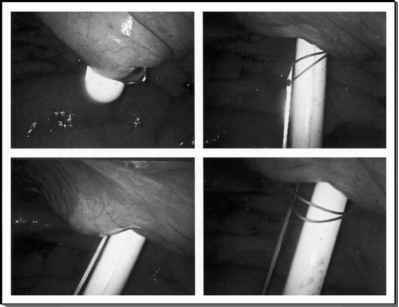 ■ In laparoscopic vesicourethral anastomosis, the main difficulty may still reside in the tying of the first knot; this step must successfully achieve two main goals, as the approximation of the bladder as well as the adequate start point of an immediately watertight anastomosis. The use of two hemicircumferential running sutures instead of interrupted sutures greatly simplified a crucial part of laparoscopic radical prostatectomy. Such technical advances made laparoscopic prostatectomy coming closer to the operating times of open radical prostatectomy while reducing postoperative morbidity. ■ The "single knot" running urethrovesical anastomosis described offers another simplifying step to the laparoscopic surgeon interested in performing laparoscopic radical prostatectomy. The method is easy to learn and perform, is watertight and appears to have a low risk of bladder neck contracture. This may enable surgeons with limited suturing experience to master this difficult technical step, unavoidably located at the end of a very challenging procedure.